Egypt's national team doctor, Mohamed Abu El Ela, has confirmed that Zamalek goalkeeper Ahmed El Shenawy will miss the World Cup in Russia. El Shenawy picked up a knee injury in Zamalek's Egyptian league match against Al Ittihad last Thursday and was then taken to hospital for tests. 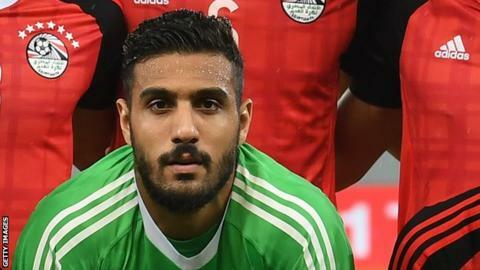 "El Shenawy had a medical examination which showed he will not be able to play in the next World Cup as he has an anterior cruciate ligament injury," Abu El Ela told BBC Sport. El Shenawy, 26, was a key part of Egypt head coach Hector Cuper's World Cup plans, and the news comes as a big blow to both the country and player. "I want to thank Allah for everything, this is my fate and I accept it," El Shenawy tweeted. "This injury is a test from Allah, the anterior cruciate ligament injury was confirmed and I will travel to Germany soon for treatment. I need a prayer from all of you," El Shenawy added. The Zamalek keeper was expected to contest the number one goalkeeping jersey with veteran Essam El Hadary at Russia 2018. El Hadary, 45, could become the oldest man to play at a World Cup if he features for the Pharaohs this summer. Ahmed Nagi, a goalkeeping coach with the Egyptian national team, expressed his regret at the news that El Shenawy would miss the World Cup. "Ahmed El Shenawy is a great talent, I'm so sad because of his injury but he will still have a chance to play at another World Cup as he still young and he will be back better, I'm sure. I wish him a quick recovery," Nagi wrote on social media. Egypt have been drawn in Group A for the World Cup where they will face hosts Russia, Saudi Arabia and Uruguay.